We get it. Family vacations with kids can be a little challenging to find a restaurant with a menu to please everyone. As great as sushi or an amazing steak sound, the kids may have a hard time picking something that they will like. So we've narrowed down a few of our favorite spots around town that our kids enjoy. These restaurants in Bozeman offer a good variety on their menu, and all are pretty affordable for families on a budget. Enjoy! One of the newer restaurants on Bozeman's west side, Sidewinders offers a great mix of American fare, including a kids menu with pasta, burgers, pizza, chicken fingers, and quesadillas. Another great amenity at Sidewinders is their game room to keep the kids entertained while they wait for the food to be served. For the adults, Sidewinders offers similar menu options with a larger variety of choices. You will find yummy salads, a good selection of specialty burgers, pizza, delicious sandwiches and some great entrees including BBQ Spare Ribs, Blackened Rainbow Trout, and Cajun Chicken Pasta. For the beer lovers, Sidewinders has a large selection of beers from all over the country on tap along with a full bar. If you are in the mood for pizza after a busy day on the ski slopes, MacKenzie River Pizza Company is a great option. MacKenzie River first opened in Bozeman 24 years ago but has since opened additional franchises in Montana, Idaho, Washington, North Dakota, South Dakota, Ohio, Kentucky, Indiana, and Nevada. Their menu offers some unique signature pizzas along with flatbreads, yummy sandwiches, pastas, and salads. 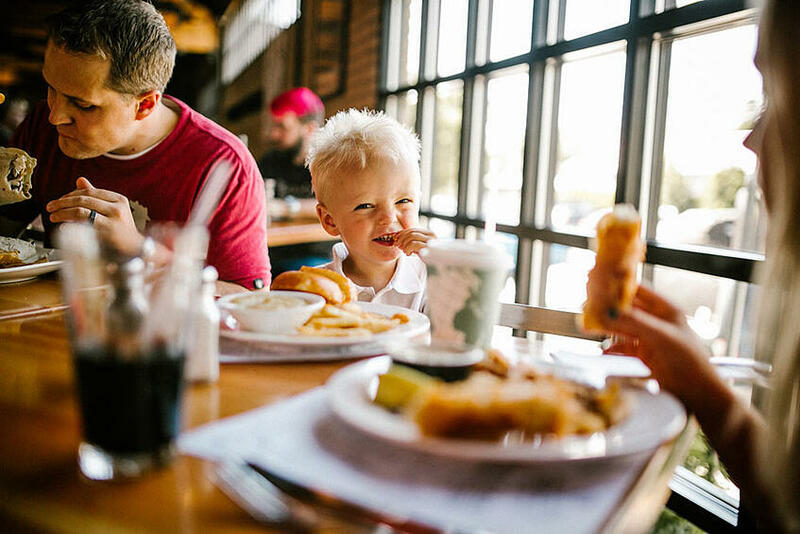 MacKenzie also offers a great kids menu with a variety of options, and make sure to order some Lodgepole breadsticks as appetizers. They are delicious. At Burger Bob's you will find... you guessed it, great burgers. Burger Bob's has become a Bozeman staple with a long list of burgers and sandwiches at an affordable price. It is located right downtown, so a great starting point to explore downtown or do a little shopping. The kids' menu offers a few additional options like mac & cheese for the little ones. Red Chair is named after Bridger Bowl's famed red chairs that used to hang throughout the ski area. You will now find a chair or two hanging from the restaurant's rafters. Red Chair is located on Bozeman's west side with a uniquely designed layout featuring 360 degrees of Bozeman and the Gallatin Valley. For the kiddos, we recommend the cheese flatbread or the grilled chicken, and we can't forget about their amazing desserts. Red Chair also features a full bar for the adults looking to sample the local beers or enjoy a cocktail after a day hiking around Hyalite Recreation Area. Midtown Tavern is another restaurant with great food, full bar and a game room for the kids. On the kids' menu, you will find a kid-sized steak, fish & chips, grilled chicken, and the usual chicken tenders or a burger. For mom and dad, they offer options like eggplant gnocchi, Boursin chicken, a huckleberry burger, delicious wings and tacos, yummy salads and some amazing appetizers. And to top off the great food, we can't forget about the Bridger Game Room with pool and darts to keep the kids occupied. The Bay Bar & Grille is located inside of the Gallatin Valley Mall, so there is plenty of room for the kids to roam if they get happy feet. The extensive menu may favor the adults a little more than the kids, but they do have great options that the little ones will enjoy like pizzas, quesadillas, burgers or mac & cheese. The adults will enjoy their delicious salads, steaks, yummy burgers, pizzas and their specialty cocktails. You can't pass up the dragon tenders for an appetizer. Yes, Fuddruckers is a franchise restaurant, but if you are looking to entertain the kids during dinner, this is the place to go. Fuddruckers features an arcade that will keep the kids busy as they win tickets for prizes. As for the menu, they are known for their burgers, but they also offer salads, chicken sandwiches, and more. For the kids, they offer chicken tenders, grilled cheese sandwiches, hot dogs and more. For mom and dad, they also serve a variety of local beers. This is a great spot for kids who have a hard time sitting still or just need a little extra stimulation. Fuddruckers is located right near the Gallatin Valley Mall along Huffine Lane.